Uglyworld #475 - Sunday Morning Pancakes (115-365), originally uploaded by www.bazpics.com. With the Series 2 kids arriving at our house in Aachen yesterday I'm sure you can already imagine the sort of manic fun that's been going on non-stop since they arrived! Rolf and Ralf (Wage and Babo's dogs) have been one of the main attractions, and believe me the pair of them have been loving the amount of attention they're receiving (hopefully everyone will continue to look after them in the weeks and months to come). While most of the guys were outside with the dogs this morning Ox decided that he would treat Poe and Trunko to their first taste of homemade pancakes (Mireille taught him how to make them previously). 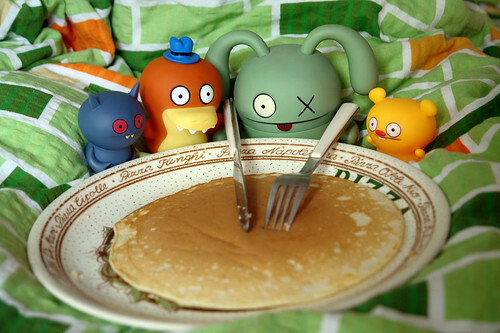 As soon as Crocadoca caught the smell of the pancakes he tracked down Ox and the 2 new guys and declared that he wanted some too! Just look at the excitement on Poe's face at the prospect of getting a big lump of that tasty homemade pancake in his belly, he's even rubbing his belly at the thought of it!! !